It's hard to believe that Braska is coming up on 19 months in just a couple days. Just doesn't seem like that's possible. But what do I know... I've never done this before. 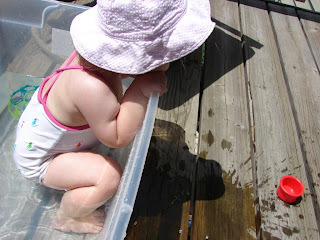 I thought I'd kind of summarize where we are, partly for my use later, as the blog is my electronic baby book, and partly because there are a few of you out there who actually are occasionally interested in more info than just cute pics and giggles. Shocking, maybe. Feeding: She's not. Period. That's the short version. The longer version is that she does sometimes accept food in small amounts and very particular situations, but it's very rare. She's still fed about 99.8% by her g-tube. She does accept drops of "milk" (Pediasure) off my finger, and sometimes dripped from a straw, while she's getting her feedings, but that's about the only consistent element of her oral feeds. We're working to get started with new OTs through First Steps and privately, and they'll focus on feeding. We've also been looking into a few intensive feeding programs around the country, but we've found that it's highly unlikely that our insurance will pay for any of that, so we're trying the outpatient OT direction first. Just as a reminder... she has no physical reason for not eating. She has no esophageal or swallowing issues. She just plain chooses not to. That kind of makes it more difficult overall. But we're working on it. 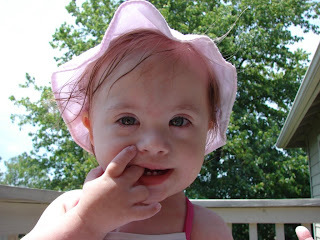 And I also like to point out that her feeding issues are NOT at this point caused by her Down syndrome. Initially it was due to her heart issues which are related to the DS, but she's gone far beyond the "norm" for feeding issues with DS. I just don't want anyone to misunderstand and think that this is a "DS thing." Her oral motor skills are actually pretty good, with her speech and all... This is just a Braska thing. GI/G-tube: Her button is doing well. The granulation that has threatened to become a bigger problem has retracted and is not an issue for now. It is a natural part of having a g-tube as the body keeps trying to get rid of that foreign object, but thankfully, we're in good shape for now. Cardio/heart: She is peachy as far as her heart is concerned. We've had no problems, all good reports, and she has her next check-up with her cardiologist and possible echo in November. We have no reason to believe there will be anything but a thumbs up then. Gross motor: She's just getting ready to start regular PT. She's showing interest in standing and movement, though she is pretty firm about doing it her way. She is not crawling at this point, and she's not yet able to pull herself to a stand. She stands when propped into that position and when she can hold onto something. She can scoot around on her rear end some, but she generally rolls to where she wants to be and then sits up to get into things. She'll be getting her Sure Steps in the next month or so, and that will help with proper form for standing and learning to walk. One PT that we saw recently for an eval stated that she had "the lowest tone" she had ever seen. I said that's fine, but "can you fix it??" (This refers to low muscle tone or hypotonia, a common physical characteristic of DS, but not exclusive to kids with DS.) We know we can get her there, she's just gonna have to work hard. Speech: She does really well with her communication, though she still has delays on the typical measurements. She can say a few words verbally: up, mama, daddy, fish. (In case you missed it, see yesterday's post.) There are a few more that she's doing sometimes, but we're not yet giving her full credit yet: badger (weird, I know...see here), teeth, and yes. She can sign several, at least some version of the sign, but it's a gesture which means the same thing every time, and she can use them in context to communicate, not just mimicking: yes, no, hi, bye, milk, please, clap. On the receptive language side (things she understands but cannot express yet) she has a bunch. Our faves to have her do for "tricks" are to give kisses and hugs, give five, put things in or out of something, splash, kick, wiggle, play music, and show her teeth. She also can lay down or stand up on command (standing with hands to grab onto). We're very pleased with how well she's doing in this. We're hoping to start with our new speech therapist in the next couple weeks. Weight/height: She's now 18 lbs 4 oz officially. She's 28.5 inches long. She's definitely small, but she's not all bones, never fear. But it is funny that she doesn't have that little round baby belly. Teeth: She got her bottom front two first, then her top front two, and now she's got 6 coming in at the same time. And they take SO long to come in! She's working on the two on either side of the upper front two and the bottom front two, and also two molars on the top. She's getting them in a "typical" order, and so far, no super sharp ones, so that's nice. Overall health: She still has never had a sinus infection, ear infection, or other common sickness. 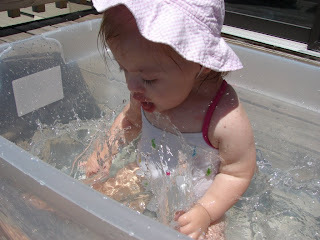 She may have had a cold once, but we're not sure if it was that or her teething. But I think it's great that she's never had to have antibiotics or anything prescribed for any reason except her granulation on the button. So that's about it I think. If you ever have questions about anything, please feel free to email me. My email is always in my profile (over to the right under Contributors). I can't tell you how much it means that we have so many people who care about our little princess. Thanks for reading her stories and watching her videos and enjoying all her cuteness! Just for those of you who prefer pics to details and jabber about therapy, here's a few more from the tiny pool days last week. Now how do I get it back in here? Sorry, they just don't come any cuter than that. 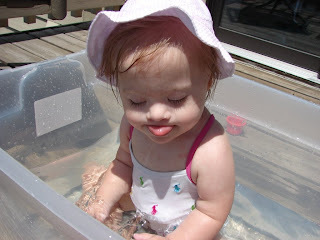 She is so cute splashin in her pool! I think that once you find an OT that specializes in feeding you will see huge improvements. We've come a LONG way since we started with ours. Delphine still has much work to do, but there was progress! I hope that for you too. 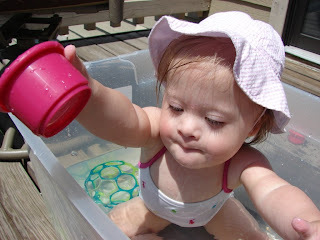 What a big girl in a tiny pool! Thanks for the detailed report, I'm always interested. The eating thing sounds hard, I hope you get some good help from your new people. Her speech is great! The tricks are really funny, aside from being big accomplishments! Abby won't do anything on command. You know I have to say that I am relieved that I didn't have to deal with feeding issues with Gabi. Well we hadd reflux feeding issues prior to her heart surgery, but nothing like what Braska has to deal with. But let me see if I can help... Braska food is so yummy! I eat lots and lots of it! Try it, it'll give you cute pudgy cheeks that people love to kiss. I know you get lots of those now and you are as cute as a button, but try some chubby cheeks and see what happens. Okay? Now go get some yummy food to eat. Preston is pretty partial to Del Monte's apples and chicken blend. You are right, she has cuteness in spades! I truly hope we all get to meet one day!